The Sea Dogs used a six-run sixth to over come an early deficit and down the New Britain Rock Cats (MIN), 10-4. Starting pitcher Mike Aguliera threw seven innings of four-run ball, surrendering eight hits and one walk while striking out three. To Aguliera's credit, all four runs came in one inning of what was otherwise a strong outing. Matty Ott and Michael Olmstead combined to pitch the perfect two innings, racking up three strikeouts between them. Every starter for the Sea Dogs picked up at least one hit in the contest, with Stefan Welch collecting three hits and walking once on the night. Mookie Betts continues his torrid start to the year, going 2 for 4, including an RBI double in the sixth. Blake Swihart started that sixth inning rally with a double of his own and Deven Marrero went 1 for 4 with two runs scored and a double of his own. Salem was shut out, 3-0, by the Myrtle Beach Pelicans (TEX) despite a strong showing from starting pitcher Corey Littrell. Littrell threw six innings of two-run ball, allowing six hits and two walks while striking out seven. Both runs off of Littrell came in the early going, giving up one in the first and one in the second before settling down for the rest of his outing. Not much went Salem's way on offense as they managed only two hits and three walks in the ball game, though they had nothing to show for it. Greenville rode a strong start from Teddy Stankiewicz to a 4-1 victory over the Kannapolis Intimidators (CHW). Stankiewicz surrendered three hits and three walks in five innings pitched while striking out four. Mike Adams struggled in relief, allowing Kannapolis to score on four hits and two walks across three innings. Jonathan Aro pitched around a walk in the ninth to pick up the save. Designated hitter Kevin Mager did most of the damage with one swing of the bat, hitting a three-run home run in the third to plate Jantzen Witte and Jimmy Rider. Rider was a tough out, walking three times in four trips to the plate. Bo Greenwell scored the final run for the Drive in the fifth thanks to an errant throw on a Tim Roberson sacrifice fly. Player of the Day: Teddy Stankiewicz's strong outing earns him the nod on a night when he picked up the victory. Stankiewicz, Boston's second round selection last year, was less inspiring in his first start of the season, giving up five runs on eight hits in only four innings of work. 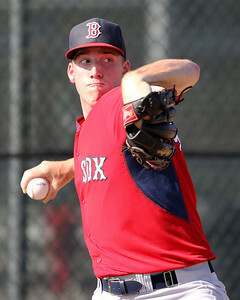 Last season, pitching exclusively for the Lowell Spinners, the now 20-year-old allowed only six runs in 19 2/3 innings pitched while striking out 15 and walking only two.